Sort through dry beans to remove all stones and any other debris. Place beans in a large bowl and cover with water at least 2″ above beans. Soak for 12 hours. Dump water and rinse beans in a colander. 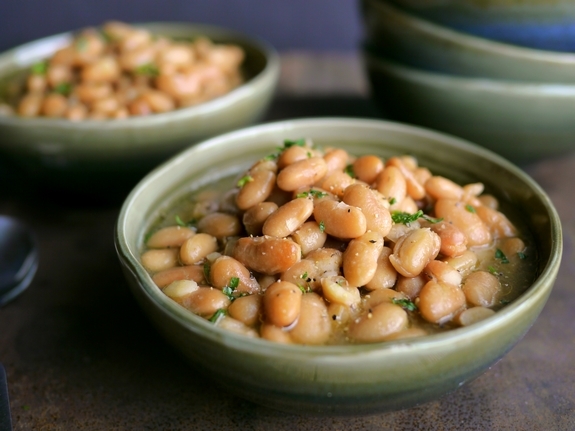 Add beans to a 6-7 quart slow cooker. Sprinkle chicken bouillon on top of beans. Cover beans with water, at least 1″ above beans. Add butter. Cook beans on high for 3 hours. Add salsa verde and cook one hour more. Garnish beans with cilantro if you like. Serve a bowl with warm tortillas or enjoy by themselves.